Whilst there is no direct legal requirement to provide green roofs in New Zealand, indirectly there may be a requirement as mitigation for adverse effects on visual amenity, natural habitats, lack of permeable site area or private open space. The provision of a green roof may in fact provide appropriate mitigation in terms of adverse effects on the environment and as such speed up the planning process. The provision of a living roof can result in increased property values. Accessible roof top gardens or open space, provide another level of marketable floor space. Living roofs can reduce heating and cooling bills by insulating the building. These systems can act as a natural insulator helping keep heat out and reducing the need for air conditioning in summer. In winter they can help keep the warmth in and as such reduce heating demand. Planting can reduce energy costs by providing summer shade and relief from summer heat. Naturally vegetation and substrate lose water through evaporation and transpiration. As evaporation and transpiration occurs it has a cooling effect. Research undertaken in Toronto, entitled Report on the Environmental Benefits and Costs of Green Roof Technology for the City of Toronto (2004), estimated that there could be a $21 million energy saving from the implementation of a citywide green roofing scheme, based on annual energy savings of 4.15 kWh/m2. Studies in Germany and the US also suggest that cities can have significant energy savings from the introduction of green roofs. 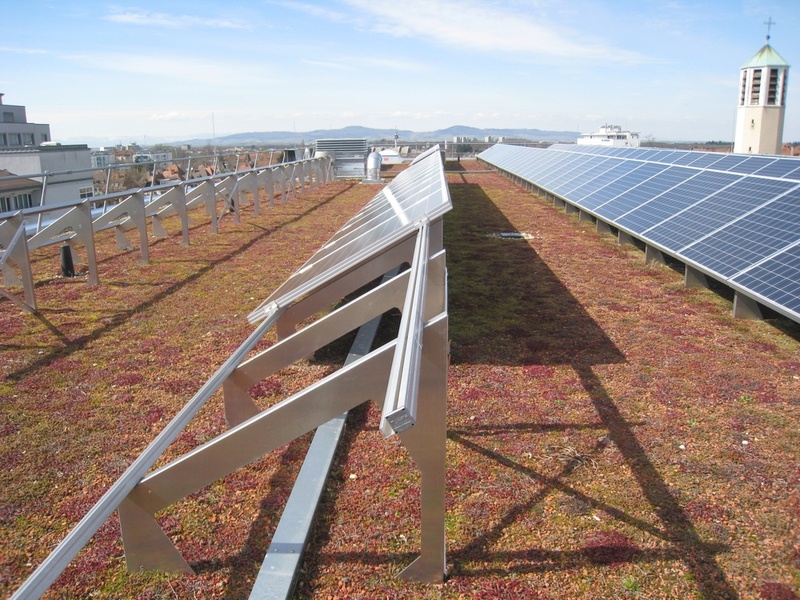 This insulating and cooling of the green roof building reduces energy expenditure and carbon emissions. Living Roofs may reduce the water storage requirements and drainage infrastructure on a site. Some drainage layers are manufactured using recycled plastics. Substrates can, as seen in many extensive roofs in London, reuse building materials from a site such as brick and concrete. This reuse of materials can have significant cost savings. You can even use household compost for the green roofs organic matter. Living roofs protect the roof membrane from ultraviolet and weather damage which in turn can extend the roof life by two or three times. The installation of a green roof can therefore save the client money by doubling the life of the waterproof layer. In Germany the first living roofs created, were by covering wet bitumen with 60mm of sand. These roofs subsequently became naturally vegetated. NZ has a green building rating system called Green Star NZ. Living Roofs can increase your green star rating, as they provide a number of benefits that can be included in the calculators from energy, ecology to emissions. Apart from raising the green credentials of the buildings owners and occupiers, installing a green roof supports the growth of new environmental business. Living roofs can benefit the whole life cost of the building. Limited research is available on this matter, yet recent research in London has shown a benefit to the whole life cost of a building with the incorporation of a green roof.